What would cause air bubbles in the toilet when I'm showering? My basement bathroom has recently been remodeled, everything was working fine for a few weeks, but now all of a sudden I am hearing bubbles in the toilet when I shower, at which point the shower drain begins to back up. 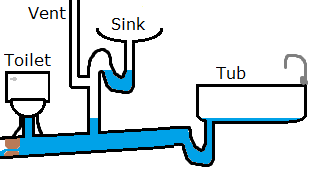 The shower drain runs downstream to the bathroom sink (which has a vent stack) then to the toilet. I have not had any problems with the sink drain slowing or backing up.. just the shower and toilet. Within an hour or so of the shower draining out I can use the toilet again without any problems, but when the shower is used again the same problem persists.. What is causing this? Sounds like the main drain for the bathroom may be restricted. As you shower the water doesn't drain away fast enough, and the plumbing begins to fill with water. 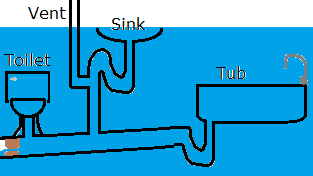 As the pipes fill, air may be forced out through the toilet trap causing "bubbles". Since the tub is the lowest drain, the water backs up there first. If you continued to shower, you'd eventually see the toilet overflow as well (if the tub edge is higher than the toilet rim). If the tub was deep enough, you'd eventually see the sink overflow too. If you look at this crude representation of your bathroom, you'll be able to see what I mean. Now, if we add in a clog we can start to see what happens when you shower. As you shower the water cannot pass through the clog fast enough, and the pipes begin to fill. 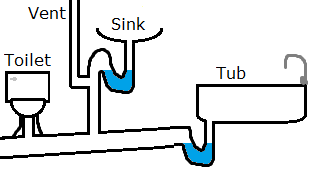 At this point, any air trapped in the line between the drain and the toilet trap will be forced out and bubble up trough the trap. As you continue to shower, the tub is the first to back up. Eventually, if you shower long enough the toilet could also overflow. Depending on the height of the sink, quite a bit of the bathroom would have to fill before it overflowed. The first thing I'd try is to clear the drain using a Plumber's snake. 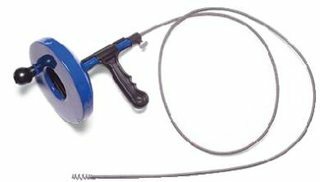 A hand auger would likely work, and can be purchased at a local hardware store fairly cheaply. 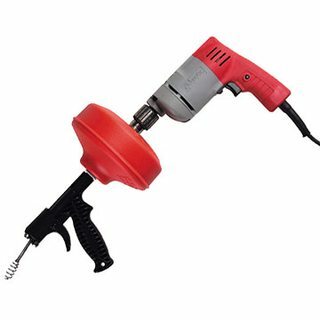 Drill powered augers are also available for a bit higher price, but require a bit more of a gentle touch (and obviously a drill). Another option is that the vent for the bathroom is clogged, or not sized appropriately. If vent stacks are not covered properly, leaves and other debris can become lodged in the pipe and prevent air flow. A clogged vent will cause the fixtures it's venting to drain slowly, and the results can be similar to a clog as described above. As with the clog, the solution to clear the blocked vent is a Plumber's snake. I do not agree with Tester's assessment but I do agree with his pictures. If the shower is not vented the air in the pipe will go out the easiest place which is the toilet - and this is a plumbing design flaw. If you had a restriction then you would probably have water backup in shower. The remodeler needs to fix it. No telling what kind of up-hill drain is involved. Was there a permit and inspection? My daughter had a remodeler do her master bath. They didn't even put a trap in the shower drain. No permit. No inspection. Had to hire a real plumber to fix it. Not the answer you're looking for? Browse other questions tagged plumbing bathroom or ask your own question. 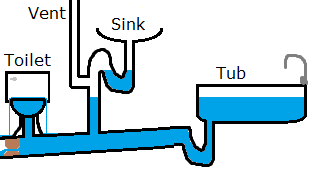 What causes tub drain to gurgle when toilet flushed? Why are there bubbles in my bathroom toilet and sink? What could cause bubbling in the downstairs toilet of an urban condo? Can I break up the floor of a raised floor basement bathroom without damaging the plumbing? What could be causing drainage issues in our new bathroom?